This practical guide to designing electronic circuits using small computers and programmable calculators makes it easy to implement both classical and sophisticated design techniques. It uses the interaction between circuit designer and computer to clarify both design techniques and fundamental concepts. It also shows how to produce useful answers quickly, while developing a feel (or the procedure and obtaining insight into fundamental processes-- such as the errors between exact derivatives and their finite-difference estimates. 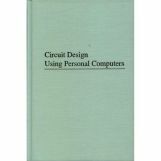 Circuit Design Using Personal Computers is intended for practicing electrical engineers and for university students with at least senior-class standing. Its topics will also interest electronics engineers. who design circuits derived in terms of complex variables and functions, to provide impedance matching. filtering. and linear amplification. Circuits operating from very low frequencies all the way through millimeter waves can be designed by these techniques. The necessary numerical methods will also be of interest to readers who do not have specific applications. The numerical methods presented include solution of complex linear equations, integration. curve fitting by rational functions, nonlinear optimization, and operations on complex polynomials. These programmed tools are applied to examples of filter synthesis, to illustrate the subject as well as the numerical methods. Several powerful direct-design methods for filters are described, and both single-frequency and broadband impedance-matching techniques and limitations are explained. An efficient ladder network analysis' method, suitable for hand-held or larger computers is treated and programmed for confirming network design and evaluating various effects, including component sensitivities. The methods presented in the book are supported by seventeen programs in reverse Polish notation (RPN) for Hewlett-Packard HP-67 and HP-97 handheld programmable calculators and. with minor modifications, for models HP-4IC and HP-98IS, and are also furnished in twenty-eight programs in microsoft BASIC language for PET and similar desktop computers.